A Randall Lineback Tomahawk Chop is such a pure thing of beauty that you want to keep the preparation as simple as possible. Let those flavors shine through, and you'll have a dinner to remember! This recipe seals in the chops' flavor and juices with a quick sear, then allows for buttery tenderness by finishing with a super low heat in the oven. To die for! 1. 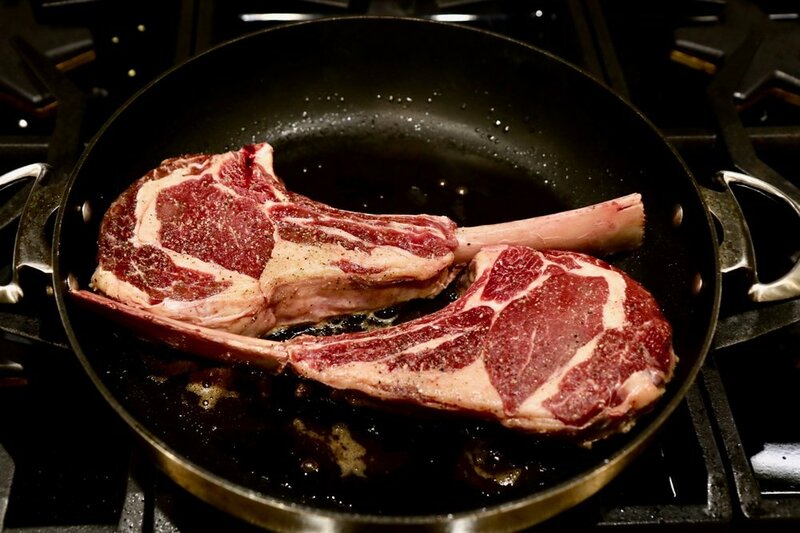 Remove fully thawed Tomahawk Chops from vacuum packaging (you may experience an umami smell from the wet aging process— that is nothing to worry about). 2. Thoroughly pat dry with paper towels. 3. Crack a generous amount of freshly ground salt and pepper onto both sides of each chop. 4. If you have decided to use garlic or additional spices (we think less is more), mix together in a bowl and spread evenly on both sides of each shop. 5. Leave chops to come to room temperature (1 hour). 6. Preheat oven to 200˚F (I know this seems low!). 7. Heat unsalted butter in an oven-proof skillet or sauté pan over medium high heat until foaming. 8. Sear the chops for approximately 2-2.5 minutes until well browned. Turn over and sear the other side for the same amount of time. 9. Transfer pan with chops in it to the oven. 10. 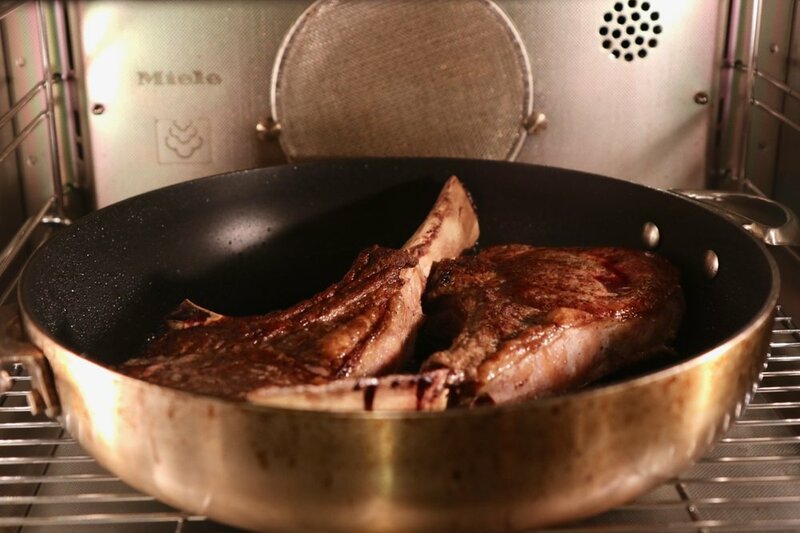 Cook for 15-20 minutes, until an instant read thermometer reads your desired doneness. In our household, it took 17 minutes to reach medium rare. 11. Remove from oven, transfer chops to cutting board and tent under foil for 10 minutes to allow them to reabsorb their juices. 12. Serve naked or with compound butter.